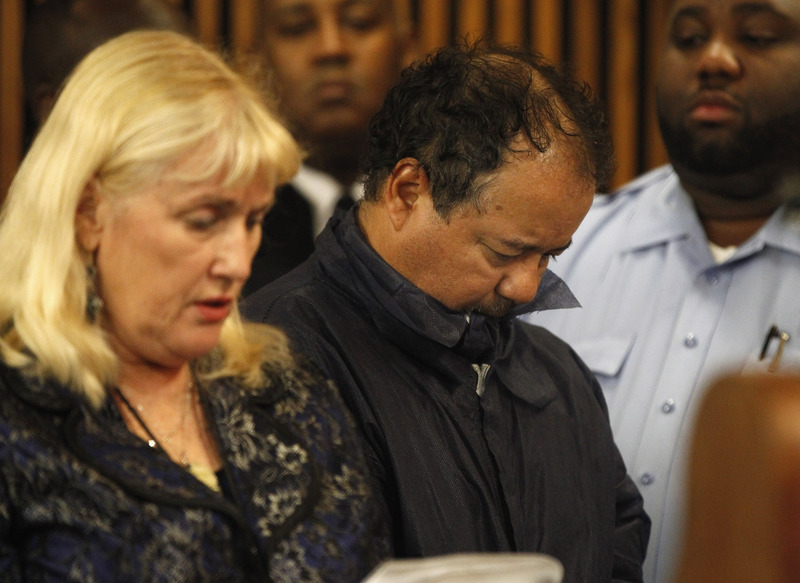 In a sentencing set to shock no-one, Ariel Castro will officially serve the rest of his life in prison, without the possibility of parole, and has been sentenced with an extra millennium for good measure. In court today, Castro denied committing violence, saying he plead guilty to all charges only to avoid further traumatizing his victims, and insists there was "harmony in the household". He told the court he abducted and entrapped Amanda Berry, Michelle Knight, and Georgina DeJesus for purely sexual purposes, and apologized to the victims. Judge Michael Russo told Castro that his thousand years' worth of jail time was "commensurate with the harm you've done." He added: "A person can only die in prison once...You don't deserve to be out in our community. You're too dangerous." In his testimony, Castro described himself as a "very emotional person," adding "I'm not a violent person. I simply kept them there so they couldn't leave." The three women were held captive for a decade. Thank you, victims. Please find it in your heart to forgive me. Prosecutors likened Castro to John Wayne Gacy and Ted Bundy, saying that Castro had noted that, if given the chance, he'd do it all over again. "He doesn't believe he did anything wrong," said Tim McGinty. "He has no excuse." Defense attorneys said that some of the testimonies presented to the judge were "inappropriate" and contained "private" content. The sentencing is still ongoing, but Judge Michael Russo has already sentenced Castro to hundreds of years in prison. The judge has been told that the victims exhibited signs of Stockholm's syndrome, and were treated "like animals." Nearly a hundred feet and a hundred pounds of chains and padlocks were found in Castro's home, and Castro himself admitted in previous testimony that he kidnapped the women with the sole aim of "satisfying" his sexual needs. I cried every night, I was so alone. Years turned into an eternity. I spent eleven years in hell, where your hell is just beginning. You deserve to spend life in prison. After eleven years, I am finally being heard, and it is liberating. Disturbing pictures have also been shown to the judge, such as Amanda Berry's room. The State has submitted a complete evaluation of the women's experience in Castro's home for a decade. Evidence includes depositions, videotaped interviews, medical records that paint a hideous portrait of the ordeal suffered by Amanda Berry, Michelle Knight, and Georgina DeJesus. The women were repeatedly raped, beaten, starved, and tortured. Ten years after her kidnapping, Berry's cries for help were heard by a neighbor. Berry called 911: "I've been missing for 10 years," she told the operator, "and I'm here, I'm free now." Police arrived to rescue Knight and DeJesus, and place Castro under arrest. Under the plea bargain he accepted, Castro won't face the death penalty, but will die in prison. He'll be convicted of a life sentence without parole, and probably another lifetime's worth of years for good measure. “He’s never coming out," confirmed prosecutor Tim McGinty, "except nailed in a box or in an ash can. And that's justice." Castro's son Anthony said on the Today Show that his father "doesn't have any respect for human life." He agreed with the sentence — which ranges amongst the longest in recent history — and said he couldn't see himself visiting his father in prison. "I look in the mirror and I see the resemblance. And I think about what he did and how horrible it was," he added, "and I just can't help sometimes just being overcome."